Hello and welcome to our site. This is the place where we keep links to current work and old articles and assorted items about us. If you’re an old friend who’d like to keep in touch please look us up on Facebook. We grew up in Scotland and met on the first day of studying Manufacturing Engineering at Strathclyde University. 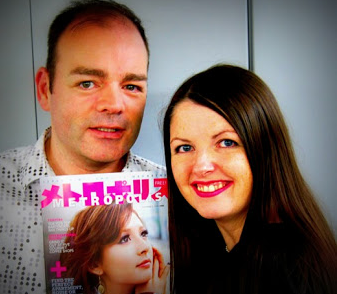 In 1989 Mark moved to Japan and Mary followed a year later. Mary worked for UBS and Mark worked for Jardine Fleming Securities. With a friend, we started Tokyo Classified in February 1994 by handing out the four-page classified ads sheet on Tokyo street corners. 14 years later, those four pages had become an 80 page full-color city and entertainment guide, with a distribution of 30,000 ABC certified copies. Renamed and expanded to Metropolis in 2003 it was, by far, Japan’s No 1 English magazine and one of the most visible successful foreign-owned businesses in that country. In 2000 we started japantoday.com, which became the No 1 site about Japan in English in the world. Japan Today was the first news site in the world to have reader comments directly under the news stories. We also started Crisscross, an innovative social search network as well as a creative agency called Crisscross Creative. When we sold the business to Terrie Lloyd in 2007 Metropolis had 35 staff, just under $4 million in annual revenues and 20% profit. We moved to Sarasota, Florida, and set up Kroaky’s Karaoke, a private room karaoke business. Unfortunately we were the victim of a fraud when Terrie Lloyd did not paid in full for the magazine and cheated us out of our collateral, which meant we did not have the funds to evolve the business and it closed in 2014. In 2016 we returned to Scotland, where are currently working on Newslines, a website that allows people to collaborate on news-based timelines about any topic. For more information about us check out our newsline.